I wish I’d had this book a few years back. The bottles at my house weren’t there so much for aging, but rather hanging out waiting to be consumed at a later time. Among some I remember: a bottle of Romulan ale in a cobalt blue bottle, plus a few that I’ve come to learn were rather valuable—a Rodenbach Alexander and a decade-old Cantillon. Now, I’m up to two refrigerators, set at cellar temp, and still without a clue. Just a lot of different beers that I keep not drinking, including a flight of annual Black Butte Porter bottles from Deschutes Brewery. Enter Patrick Dawson and Vintage Beer (Storey Publishing, Paperback, $14.95, 160 pp). This is the manual for serious beer lovers who want to take their beer to the next level. Dawson starts the adventure off with 14 rules that define success in aging beers. At the heart of the book are the tips for selecting a beer to cellar. Not only does the author lay out what beers would work (hint: not that Romulan ale), but also what to expect over time. Furthermore, he recommends storage options and record keeping. The tasting notes alone are worth the price of the book. 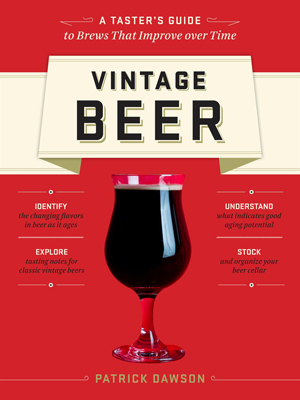 It is my hope that beer lovers across the world take up this book and create the next aesthetic wave—vintage beers, aged appropriately.